Other photos: Photo 1, Photo 2, Photo 3, Photo 4, Photo 5, Photo 6, Photo 7, Photo 8, Photo 9, Photo 10, Photo 11, Photo 12, Photo 13, Photo 14, Photo 15, Photo 16, Photo 17, Photo 18, Photo 19, Photo 20, Photo 21, Photo 22, Photo 23, Photo 24, Photo 25, Photo 26, Photo 27, Photo 28, Photo 29, Photo 30, Photo 31, Photo 32, Photo 33, Photo 34, Photo 35, Photo 36, Photo 37, Photo 38, Photo 39, Photo 40, Photo 41, Photo 42, Photo 43, Photo 44, Photo 45, Photo 46, Photo 47, Photo 48, Photo 49, Photo 50, Photo 51, Photo 52, Photo 53. 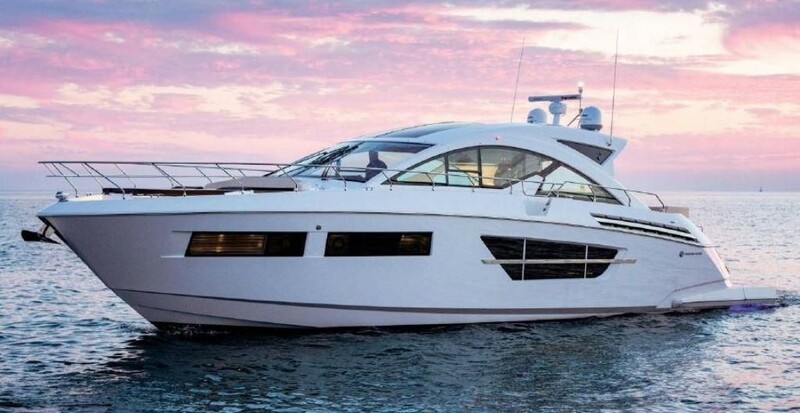 Don’t miss the chance to review this breathtaking 2008 VIKING PRINCESS 75’ SPORT CRUISER MOTOR YACHT SILVER LINING. She is in pristine condition, having been maintained by a Viking/Princess dealer. Her C-32 Caterpillars have only 790 original hours, and the 1000-hour service was performed May 2017. SILVER LINING features 4 Cabins/ 4 heads plus crew quarters. This VIKING PRINCESS 75’ SPORT CRUISER boasts exceptional storage throughout. This 75’ MOTOR YACHT is loaded with additional options and features such as bow and stern thrusters, aft docking station, 4 Underwater lights, 900 GPD water maker (Sea Recovery), passerelle and side boarding gates, and davit mounted on bridge. Inside this beautiful VIKING PRINCESS 75’ you’ll find natural cherry wood, Giallo Veneziano granite in the galley, Mojave Sand Avonite in the master head, and Furuno Navnet 2 GPS. Contact us immediately to inspect this beautiful 2008 VIKING PRINCESS 75’ SPORT CRUISER MOTOR YACHT SILVER LINING.